Deathless is a book like no other; it's a remarkably seamless blend of Russian folklore and history, stained by blood and lust, breathed to life by a master storyteller. Deathless has no boundaries: the narrative a ghostly whisper, the theme of love flowing throughout like cold, running blood, the writing a mellifluous melody. Deathless is one to be treasured. Child of the revolution, maiden of myth, bride of darkness. A handsome young man arrives in St Petersburg at the house of Marya Morevna. He is Koschei, the Tsar of Life, and he is Marya's fate. Years pass. Battle-hardened, scarred by love, and longing for respite, Marya returns to St Petersburg - only to discover a place as pitiful as the land she has just fled: a starveling city, haunted by death. MY THOUGHTS: Set against the backdrop of Stalinist St. Petersburg, our story begins to uncurl. But Deathless isn't just one story. Whilst the book is deeply rooted in the tale of Marya Morevna and Koschei the Deathless, it branches further than that, each leaf a different element of Russian folklore. Within Deathless, Valente has reearthed an old tale in a way that it has never been told before. 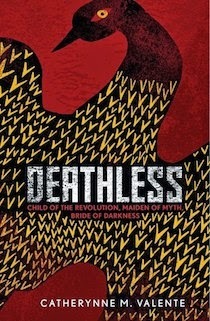 Whilst Deathless reads like a fairytale, complete with the romance between Marya Morevna and Koschei the Deathless, it's coated in darkness, sprinkled with pain and anguish. Valente pushes the theme of love to its limits and the end result is one to marvel at. And the writing style is so apt for a tale of such divine beauty. Textured, poetic, incomparable in its style: the writing is definitely a highlight. Valente's style is so distinct and unusual that Deathless really is one-of-a-kind. But Ivan went white and trembled in his long grey coat. He looked at the blood fountains gurgling and spraying. He looked at the braids lying along the eaves, the chapels with their skin doors and bone crosses, the gate of antler and skulls. He looked at the black domes of the Chernosvyat looming before them, all shadows. 'This is hell,' he whispered. Marya saw his hand twitch, longing to cross himself, keeping his fingers still for her sake alone – and she liked that, that in his horror he still wishes to please her. "No, no, it's not like that. This is the Country of Life. It's all living, see? The blood and the skin and the bone and the fur. It's all alive. Nothing here is dead, nothing. It's beautiful." Whilst Deathless won't be the book for everyone, I recommend to anyone and everyone who wants to read a fantasy novel that really captures the spirit of both Russian folklore and 20th century Russia. And that's it – I have no words left. I just wish I had written this book. You can probably tell from reading any of the quotations featured throughout this review that Deathless really is a special tale. I love the historical aspect of the plot of this novel. Great review, I've added it to my goodreads TBR. The cover is so beautiful too! I've recently become very intrigued by fantasy novels and with the element of Russian Folklore in this one it does sound quite spectacular. OMFG that has to be one of the best written reviews I've read in forever. Now I wish I wrote that review. After finishing Ruin and Rising I haven't been able to read any Russian inspired things but I think you've answered my prayers. Aw thank you! I haven't read Ruin and Rising yet but I need to get around to it!